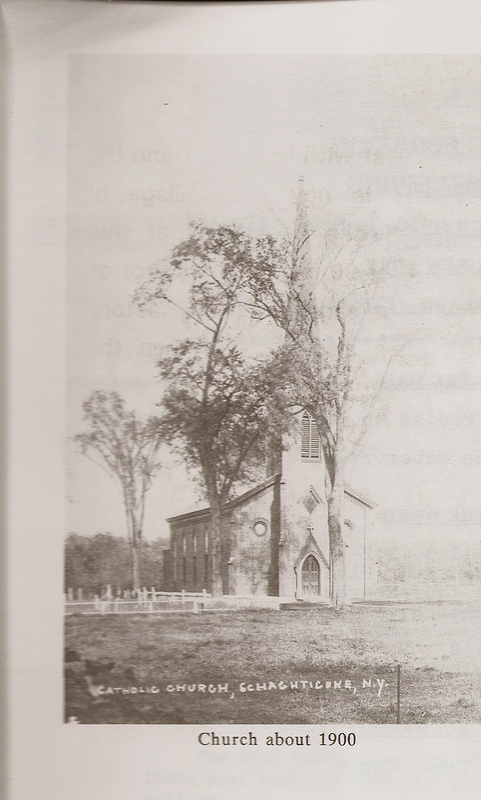 In previous posts, I have recounted the history of various churches in Schaghticoke. Next up is St. John the Baptist Roman Catholic Church, now Church of the Transfiguration. To step back and look at the big picture for a minute, Dutch- speaking settlers from Albany founded the Dutch Reformed Church in the 18th century in Old Schaghticoke. German- speaking Lutherans from the Palatine region of Germany founded the Lutheran Church at the end of the 18th century in the Melrose area. Incoming New Englanders began the Presbyterian and Methodist Churches in the early 19th century, both in the village of Schaghticoke and Melrose. And Irish immigrants were foremost in the founding of the Catholic Church around 1840. They had come to Schaghticoke to work in the burgeoning textile mills in the village of Schaghticoke, and on the thriving farms, some as single men, and others with their families. According to Sylvester’s History of Rensselaer County, the Catholic Church began by sending out missionaries who travelled on foot in the area from Albany to Lake Champlain from 1835 to 1845. During that time, churches were established at Schaghticoke, Pittstown, Johnsonville, and Buskirk’s Bridge, among other places, as a result of their efforts. In Schaghticoke, Father John Shannahan, pastor of St. Peter’s in Troy, guided local people to form a church in September 1839. The first trustees were Patrick Butler, John Brislan, James Ryan, Daniel Doherty, William Graham, Simon Bogan, James Conety, Anthony Wall, and Edward Ward. Of those, only three were still in town in 1850. They were John Brislan, a tailor born in Ireland; Daniel Doherty, an illiterate manufacturer born in Ireland; and William Graham, a dyer born in Ireland. At first services were held in a school house, located on Chestnut Street just across the street from the old town garage. Father James Quinn, assistant pastor at St. Peter’s, was the first priest. The parish also included Valley Falls and Johnsonville. George Tibbits of Troy donated the original 160 x 60’ lot for the church building, which was completed in 1842 at a cost sometimes given as $500, sometimes as $5000. Some members said the new church looked “like a barn,” which might indicate that the lower figure is correct. According to the deed, the church trustees were to always maintain a good fence around the property. If the church ceases to be used for religious purposes, the property reverts to Mr. Tibbits or a descendant. The original deed specified that some of the land would be used as a “burying ground, and indeed there was a cemetery next to the church. About 40 Irish immigrants were buried there, in addition to others. According to Anderson’s “Landmarks of Rensselaer County,” the first priest after the church was constructed was W.P.Hogan. Over the years, the parish has been served by many priests. Quite a few of the early ones were born in Ireland, and one, Father Meagher, was born in Portugal. The Very Reverend Hugh Quigley was priest from 1849-1854. He was born in poverty in County Clare in Ireland in 1819 but was educated at the University of Sapienza in Rome..or St. Mary’s Seminary in County Cork. The biography posted by the library in County Clare states he was an Irish patriot who was forced to leave Ireland after advocating too strongly for the Irish suffering grievously during the potato famine. After another stint in Rome, he arrived in New York in 1849. The New York diocese sent him here that same year. Indeed, he shows up in the 1850 US Census for Schaghticoke, age 30, living with a housekeeper, Mary Hynes. Rev. Quigley continued to be a political activist who helped his Irish parishioners organize both civil and military organizations to celebrate their heritage. He agitated until he got the elimination of tolls for parishioners having to cross the bridge over the Hoosic River to attend mass, probably most of his flock. Quigley wrote articles debunking prejudices against Catholics. He worked on the state level for better working conditions for railroad laborers. Doing a bit of research, I found many Giffords in the southern part of Easton in the 1850 census. Elihu, 48, a well-off farmer, had a family including wife Mary, 34, (she must have been a second wife), and children including Margaret S., 16, who had attended school in the past year. She was still living at home in the 1855 census, now 21, though she had no occupation listed. Assuming she was the teacher, this would put her as 19 in 1853. Also in the 1850 census was the family of John Calahan, 38, born in Ireland, no occupation given, with wife Ellen, 36, also born in Ireland, and four children born in New York: Eugene, 9; William, 8; Ellen, 4; and Margaret, 1. Eugene, William, and Ellen had all attended school in the previous year. And this William would be the correct age to be the boy in the case. I did not find them in the 1855 census, though there were a couple of other Calahan families in Easton. The school house in South Easton, district 3, was described as frame, poor, and worth $100 in the 1855 census. It was located up Bell Road, just over the Schaghticoke border into the town of Easton, as was the Elihu Gifford farm. So the Calahans and Giffords were neighbors. I find this case wonderful to read about for many reasons. I admire many of the people involved, from Reverend Quigley, such a strong advocate for his parishioners at a time when Irish Catholics suffered from lots of prejudice in this country, to the Calahans,- both the parents, who first, travelled a long way to Schaghticoke to go to church, second, had strong beliefs which they imparted to their child, and third, stood up to the Protestant establishment in their new community.- and little William, who stood up for himself. I also admire Margaret Gifford, granted a young woman with prejudices, but a product of her time. She was probably educated only in the school where she now found herself a teacher. She consulted with her supervisors before carrying out her punishment, and perhaps was merely emulating what she had experienced herself. A young woman teacher in a one-room school could be faced with students of all ages and behaviors, really under pressure to have good discipline. Having one young man succeed at facing her down could set a very bad precedent. Anyway, returning to the wonderful Father Quigley, by the 1855 NYS census, he was living in a brick building in Lansingburgh, with a housekeeper named Bridget Gallagher., presumably serving at a church there. He went on to help develop the University of St. Mary in Chicago, and worked among the Chippewa Indians of Lake Superior and the gold miners of California. Meanwhile he wrote many books, fiction and non-fiction. The New York State census of 1855 records that the value of the Catholic Church in Schaghticoke was $2,500, and that the church also owned other real estate worth $2,500. The church seated 300 people, with average attendance of 500, more than any other church in town. The priest’s salary was $450 per year. The new priest was William Fennelly, a 44-year-old Irishman. Mary Doran, another Irish immigrant, was his housekeeper. Ten years later, the 1865 census recorded the value of the church as $8,500. The capacity was 400, with average attendance of 400 as well, and the priest’s salary was $600. In 1859, Bishop McClosky of Albany turned the parish over to the Augustinian Fathers, and Father Lewis Edge became pastor. The Augustinian Order had been in the U.S. since 1796. In 1844 there were only 12 priests and 10 lay brothers in the order. A period of growth followed, and there were 14 Augustinian churches in four states by 1874. Father Edge shows up in the 1860 census in Stillwater. 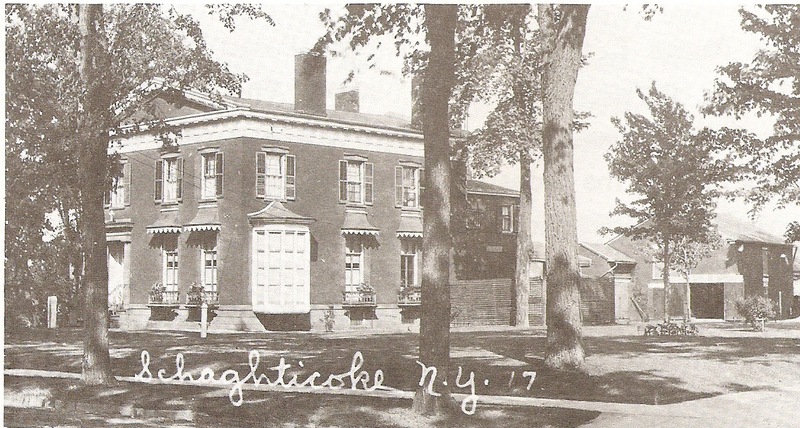 Schaghticoke had no rectory, but perhaps there was a home owned by the Augustinians across the river. He was born in Ireland, 39 years old, and lived with a housekeeper and servant. Father Edge renovated the church, adding the bell tower, increasing the size of the building, and installing stained glass windows- making it look less like a barn. He also purchased the property fronting on Route 40 from Mr. Tibbits to improve access to the church. It had faced only on the side street. The original steeple was 150’ tall, but it was lowered in 1939 after a second lightning strike. Further improvements occurred under Father James Darragh, with the purchase of a Meneeley bell “which had won honors at the fair at Saratoga” in 1866. The history written to commemorate the 150th anniversary of the parish in 1992 states that the bell was rung as a fire alarm and to celebrate national holidays in addition to its normal use to call parishioners to church. Father Darragh also oversaw the erection of the first rectory, which was located across Chestnut Street from the church. In 1867 Father George Meagher was the first to occupy the rectory, which he described as “miserable.” The building was demolished in 1967 after it was partially destroyed by fire. Though he has an Irish surname, Father Meagher was born in Portugal. The 1870 census for Schaghticoke lists him as 49 years old. Marry Murry, 29, was his housekeeper, and Edward Stearns, 15, his house servant. Over the years, priests renovated both the church and the rectory. Another major step occurred in 1872, when Father Timothy Donovan directed the purchase of 14 acres at the corner of Route 40 and Stillwater Bridge Road for a new cemetery. Some of the tombstones were moved there from the cemetery next to the church, some left behind. I have been told that those left behind were tipped over and sodded over to make lawn mowing easier, probably during the 1950’s. I know some tombstones were left as my family and I recovered a bunch of pieces after the new parking lot was installed in the late 1990’s. In 1890 a vault and a caretaker’s house, now gone, were constructed at the new cemetery. The vault was constructed by Timothy Sullivan. So far, we have not been able to learn anything about him. I recently (1/17) heard from a great-nephew of Father Donovan who told me he was born in Dromig, Skibbereen, Ireland and came to Lawrence, Massachusetts as a child. He had a short tenure at St. John’s, unfortunately, as he died of pneumonia in January 1875. He is buried back in Lawrence. The nephew provided the above photo. The 1880 census recorded the priest as E. Augustin Hala, a 41-year-old Irishman. That is a new surname to me, and I wonder if it was something quite different, just said with quite an accent. There was a second priest, James F. Oriely- actually O’Reilly ,another Irishman, aged 28. They had a housekeeper, Hannah Sweeney, and a man servant, John Madigan. The parish history skips over Hala to record that during the pastorate of Father James O’Reilly, from 1879 to 1886, the rectory was sold and the home of E.B. Arnold at 6 South Main Street, across Route 40 and now just before the bridge on the east, was purchased for $8,500. It had an ice house, windmill to pump water from the well, and a carriage house. 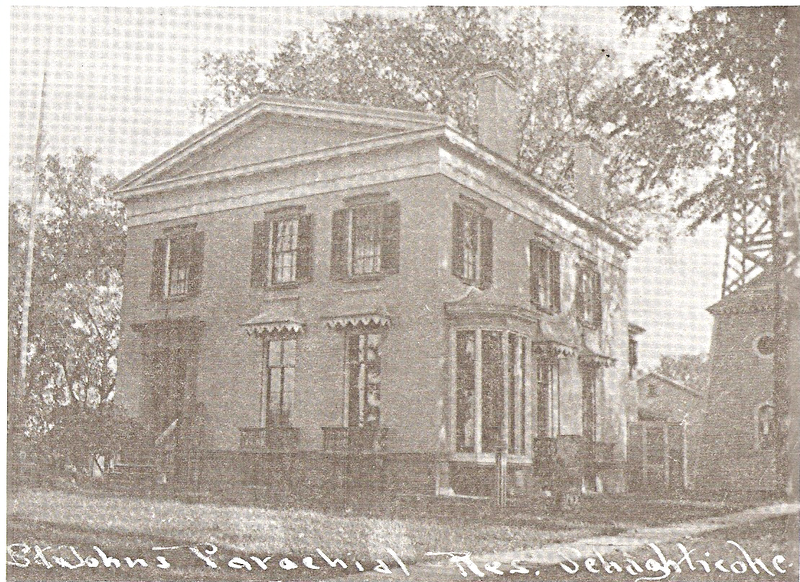 It had been the home of Oliver Arnold, a treasurer of the state of New York and first president of the village of Schaghticoke. I feel it was originally built in the 1840’s by a president of the Schaghticoke Powder Mill, Riley Loomis. Father O’Reilly also began the construction of St. Monica’s Church in Johnsonville. During the pastorate of the next priest, Father Nicholas Murphy, the missions in Johnsonville, Buskirk, and Pittstown were transferred to the Diocese, and the church in Valley Falls, Our Lady of Good Counsel, was constructed. Anderson’s “Landmarks of Rensselaer County” states that the mission in Pittstown was added during the pastorate of Reverend George Mahar. 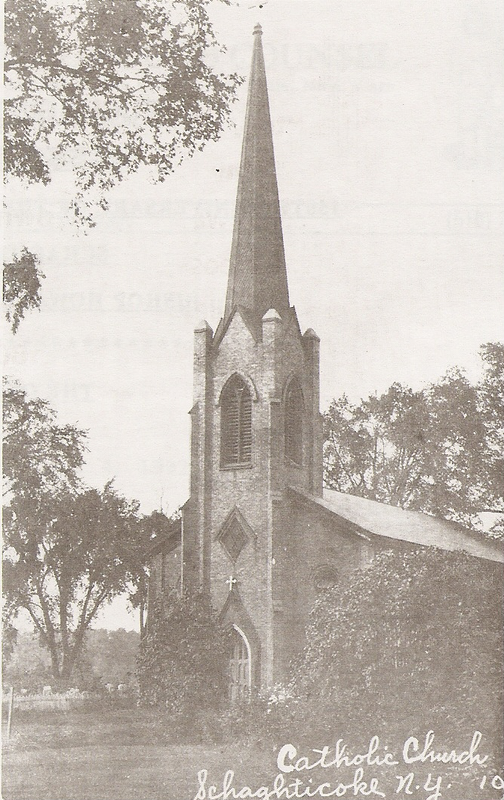 From 1872 until 1983, the parish often had an assistant pastor, ranging from young men at the start of their careers, to those who were in Schaghticoke as a pre-or partial retirement position. For example, in 1905, Father Edward Flynn and his assistant William Donovan had Anna Walsh, age 29, as cook, and Edward McCasky, age 20, who had arrived two years earlier from Poland-Russia, as a day laborer. The last assistant, Father John Vrana, served from 1980 to 1983, when he died. He had been a faculty member at Villanova University for thirty years before serving in Waterford from 1971 to 1979, and retiring to Schaghticoke the next year. There were also cooks, housekeepers, and other servants for the priests for many years. The continued growth of the Catholic community in Schaghticoke and in nearby Lansingburgh led to the establishment of a new parish in Speigletown in 1970. Originally parishioners constructed a basement, then a rectory atop it. Finally in 1974 the church of St. Bonaventure’s was completed. A large addition was dedicated in 1991. The founding pastor was Reverend James O’Neill. Back in the village of Schaghticoke St. John’s Church added a major addition in 1988, during the pastorate of Father Richard Nahman. It has social space for dinners and religious education, plus rest rooms and a gathering space in front of the church entrance. Until then, the rectory had been used for religious education, as well as living space for the priest. Father Nahman was the last priest to live there. 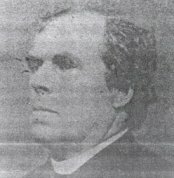 The next priest, Father Alfred Ellis, supervised renovation of the church interior, mostly volunteer work by the parishioners. In 1997 the Augustinians turned the parish back to the Albany Diocese, and the rectory was sold about the same time. Father Anthony Tomasullo was the last Augustinian pastor. 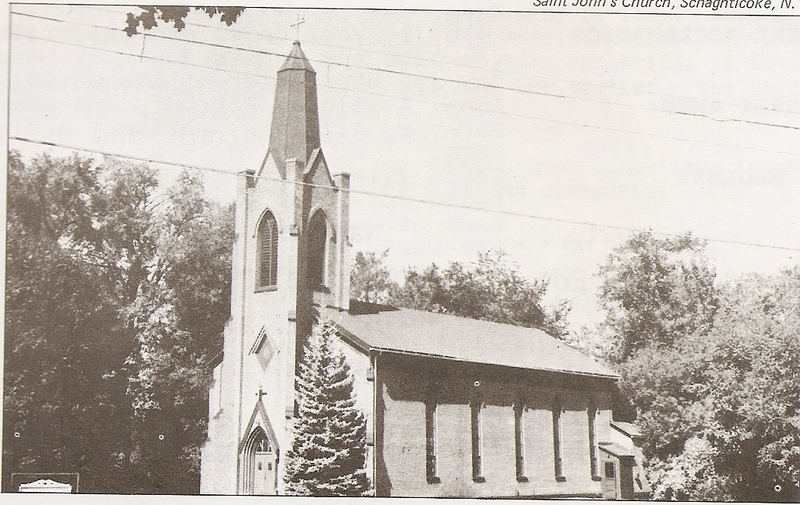 All but the youngest residents of the town have seen the latest changes in the local Catholic community.. Ironically, in 2001, just ten years after the construction of the parish hall addition to St. John’s, it merged with Our Lady of Good Counsel of Valley Falls and St. Monica’s of Johnsonville, with the closure of the latter churches. The three churches together took the name of Church of the Holy Trinity. In 2010, Holy Trinity and St. Bonaventure’s in Speigletown merged their administrations, and while both churches are still open, they are served by one priest and other administrators. They are now called Church of the Transfiguration, North and South. Bibliography: Hart, Mary, letter, 1984. Lohnes, Richard, Centennial Booklet of the Village of Schaghticoke, 1967. 150th Anniversary Booklet, Church of St. John the Baptist, 1992. The Augustinians at St. John the Baptist and Our Lady of Good Counsel, 1997. Sylvester, Nathaniel, History of Rensselaer County, 1880.